Do you feel like your income is just enough, and there’s nothing left over for savings? Or perhaps you have the good intention to save money, but before you know it’s the end of the month and you’ve spent more money than you thought you would. This happens to many people, so how can you take control of your spending? 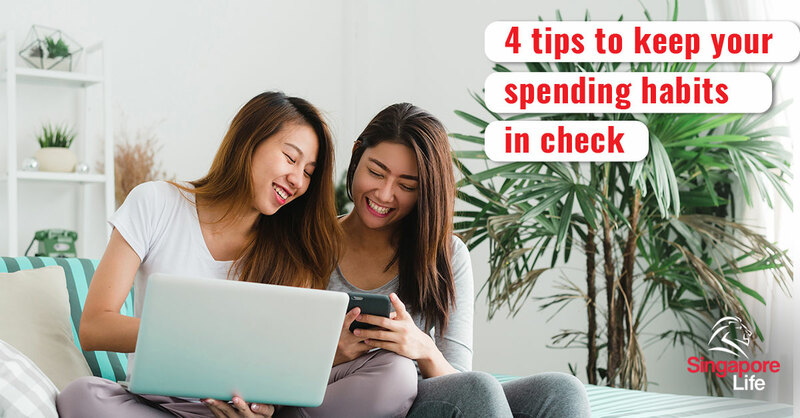 Here are four tips that can help you be more mindful of how you spend your money and break your overspending habit. Are you really overspending, and what are you overspending on? To answer these questions, we recommend you start tracking your expenses. You may think it’s a tedious exercise, but with so many budget tracking apps available, it’s really as easy as taking a few seconds after you’ve made a payment to input the expense in your chosen app. This can be an easy habit to develop as we’re usually on our phones anyway, and some people even use contactless payment systems via smartphones. Just add on that extra step of using a budget tracking app! The key is to track all of your spending, even small expenses, as well as the method of payment. You may think overspending is caused by making big expenses, but small regular expenses can affect your bottom line as well. Tracking small expenses is important as they can stack up over the month. For instance, a $5 daily cup of coffee may seem like nothing, but over 20 working days in a month that totals to $100. Tracking which method of payment you use helps you assess if you’re relying too much on credit cards and racking up large bills without realising it until the bill arrives. This might especially apply to you if you tend to use credit for everyday purchases or if you’re paying first for large bills and then get reimbursed by friends in cash. To start with, our recommendation is to track your expenses for an entire month so that you can get a better sense of your monthly spending habits. Once you know how you’re spending your money, you can then decide in which areas you can cut back your spending. Once you’ve started tracking your spending, keep the habit going! It can help you be more accountable for your money in the long term. What’s causing you to spend too much money? Often times, overspending can be linked to psychological and emotional triggers. 1. How does your mood affect your spending? For some of us, shopping is a way to relieve stress or make ourselves feel better after a bad day. If you find yourself shopping and spending more when you’re feeling stressed or upset, can you find other ways to relieve your bad mood? Instead of walking around the mall after work or browsing your favourite online store, perhaps you can try a yoga class or take a walk in a park. Finding other ways to manage your moods can limit impulse shopping and curb your overspending. 2. What type of lifestyle do you have and can you afford it? If you’re living a high-end lifestyle, it’s important to ensure that you’re not living above your means. If you are living above your means, it’s probably a good time to stop and reflect on your financial situation. Ask yourself why you’re making these lifestyle choices. What is your money mindset and are you happy living the way you are? Then, ask yourself what you can do to take control of your financial life. What creature comforts can you give up or what trade-offs are you willing to make in order to have a brighter financial future? It could mean adjusting your lifestyle in both small and big ways but making the sacrifice could pay off in the long run. 3. Are you feeling peer pressure to spend more or keep up appearances? The people we surround ourselves with can have an unconscious effect on our spending, particularly if they also have bad spending habits. If you can’t afford to spend the way your friends or even family members do, it’s okay to carve your own path. For example, you could take more control of social interactions by suggesting budget-friendly activities and options or suggest getting together at someone’s home instead of going out. You could also share with your loved ones that you’re aiming to spend less, as they could be a good source of support and may even join you. Where possible, surround yourself with people who support your financial goals and happiness. Credit cards are convenient, user-friendly, and you can earn points or rewards. In today’s fast-paced and technology-savvy society, it’s no surprise that so many people use credit cards for everyday purchases, small and big. Yet credit cards can be a huge reason why you’re overspending. The convenience of using a credit card means never seeing cash leave your hands, and psychologically this can strip away the monetary value of what you’re paying… until you see your astronomical bill at the end of the month. If you’re tracking your spending and find that a large proportion of your expenses are made via credit, we challenge you to stop using your credit cards for a month. Instead, only use cash and see how your spending habits change. When using cash, you become aware of exactly how much money you have and how your spending power reduces with every purchase. This can help re-emphasize the value of money and help limit your overspending. Here’s how you can do this. At the start of the week, withdraw the amount of cash needed for expenses during the week based on your budget. Put the money in a safe place and “withdraw” from it during the week to cover your daily spending. This is all the money you have for the week; if you find yourself low on cash, you’ll have to stretch it somehow. This could mean choosing cheaper lunch options, forgoing that night out with friends, or spending your down time doing free activities. A cash-only system will teach you not to spend money you don’t have, and how to make budget-friendly decisions. Overspending can be seen as a symptom of prioritising immediate pleasure over long-term desires. You’re buying something right now so that you can immediately get that dopamine rush and feel better. How can you refocus your mindset so that you opt for delayed gratification instead? Identifying and setting both short and long-term financial goals can be an effective way to rewire your brain so that you can put off the immediate pleasure you get from spending money. Having money goals can provide you with direction and motivation as you change your spending habits. It will be a challenging process to spend less, but if you know why you’re doing it, it becomes easier. When it comes to setting financial goals, the more specific and realistic your goals are, the better. For instance, a goal that reads “cut expenses by $200 and put that amount towards savings” is a more actionable goal than “spend less money”. You can further improve the motivation for that goal by setting a savings target and goal. For instance, if you have the goal of buying your first car, you could set a goal of saving $20,000 in 2 years for the down payment. As for long-term goals, if you’re considering how to protect your family’s financial future, getting sufficient life insurance coverage could be a good option. Or perhaps you’d like to grow your wealth so that you can provide a better life for your loved ones, start your own business, or retire early. We suggest taking some time to consider what you want in 10, 20, even 30 years from now, as well as what financial moves you need to make to achieve those goals. Once you have a clear vision for your financial future, spending money you don’t have on things that don’t really matter seems unthinkable. You can be more intentional with what you do with your money so that you can reach your financial goals. Learning how to stop overspending is a process, so don’t be too hard on yourself if you sometimes slip back into your old habits. Take it step by step and celebrate small wins! And if you find yourself returning to your old ways, revisit this article and remind yourself that you can take control of your spending habits by starting with these four tips.